Editor’s Note: This is a guest post written by Kevin Rankins from Top Ice Maker Reviews – a website dedicated to providing on-point, unbiased reviews of the newest, most popular, and best-rated commercial and residential ice makers and related accessories such as ice crushers and ice buckets. You’ll also find some useful tips on how to choose the best products for you & your venue’s needs. Making great cocktails and cold beverages for your clients isn’t all about the ingredients you use. Well-preserved tools and appliances are a must if you want to have a safe environment for mixing delicious drinks. Keeping your appliances clean and in a great shape all the time might be a difficult task. The same applies to maintaining everything in order if you are the only bartender available in the restaurant or bar. Making clients happy is the goal of every company. Among other facts, as an employee, you need to take care of your devices so as to offer high-quality services. The same goes for your ice machine – it’s important that you learn a few tricks about how to properly clean it and maintain it. Every detail is important if you want to fulfill the needs of your clientele and make the freshest drinks on the market. Hence, in what follows, we will offer some advice on how to maintain an ice maker in great shape. Nowadays, the improvement of technology is responsible for a better design and a longer life expectancy. Ice machines can monitor their own operation and in case something goes wrong, they can audibly and visibly alert owners. In case your ice machine is damaged, you can always transmit data remotely. Hence, a licensed professional is able to fix and assist the unit. You won’t have to worry since the technological advancements will not let your ice machine fail. So make sure you invest in a good product that will have a long-lasting place on the top of the bar or near other kitchen appliances you use for keeping the restaurant clientele happy. This task is part of your ice unit maintenance. You should know that the water filter can improve the quality of the water you use to make ice. Hence, it filters out sediments and dirt. Unfiltered water not only impairs the quality of the ice cubes, but it can also damage the ice unit. 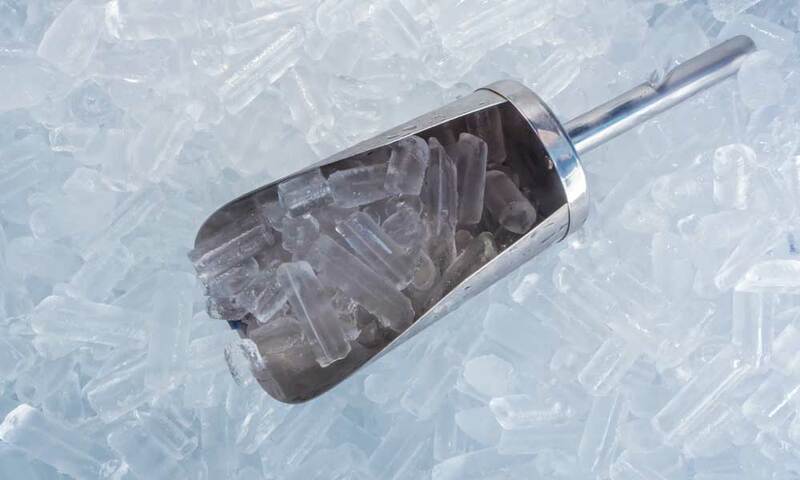 This leads to scale and slime buildup in your ice machine, causing it to break down. The ice unit’s daily output will define how it is necessary for you to change the water filter. Quality water means quality drinks, which equals happy clients. Every six months you should consider a delicate clean-up for the ice machine. Water manipulation and low temperatures create the perfect environment for the accumulation of impurities and dirt because of the dust particles in the air. After a couple of months and maybe tens of uses, you will notice the piled-up dirt under the ice machine’s case. Besides the fact that is unhygienic and bad for the health of your customers, it is also bad for the life of the ice maker too. Your machine will no longer be able to maintain an adequate temperature while it produces the ice cubes. Therefore, you have to thoroughly clean it up to prevent unpleasant events from happening. While cleaning the ice machine, you should avoid using a wet cloth when reaching its internal components. If you get those components wet while cleaning, you may damage the unit. Keep in mind the fact that this is an electric appliance which works on electric power. Therefore, moisture or excessive water while cleaning can cause severe failures. This is not only dangerous for the machine but also for you. It is like pouring water over an electric snuff. Pay attention to molds and ice plaques. Look into the small places, between the rubber and the plastic because there is where you can find mold build-up. All that mold can produce a lot of dirt, negatively impacting the performance of the ice maker. Ice plaques also impair the production of ice so you have to carefully clean the ice unit to prevent all these problems. Maintaining your customers health and keeping them happy isn’t only about offering good services or delicious drinks. It is mandatory to take care of your devices in a rigorous way because a broken machine can cause multiple problems. You can prolong the life of the ice maker if you regularly clean it and change the water filter. Pay attention to the warranty when buying this kind of machine and keep it safel because you don’t know when you may need it.